Jaguar Land Rover has opened a new car showroom at Westfield Stratford that seeks to completely change the way we shop for their cars. Rather than the traditional emphasis on selling, Jaguar Land Rover has instead shifted their focus towards information, experience and lifestyle. This move is indicative of a wider trend that is transforming retail experience, putting agency back into the consumer’s hands. A classic car showroom is all about one thing: getting you to buy a car. The vehicles are adorned with prices, and the entire retail experience is geared towards a salesman convincing you to part company with you hard earned cash. 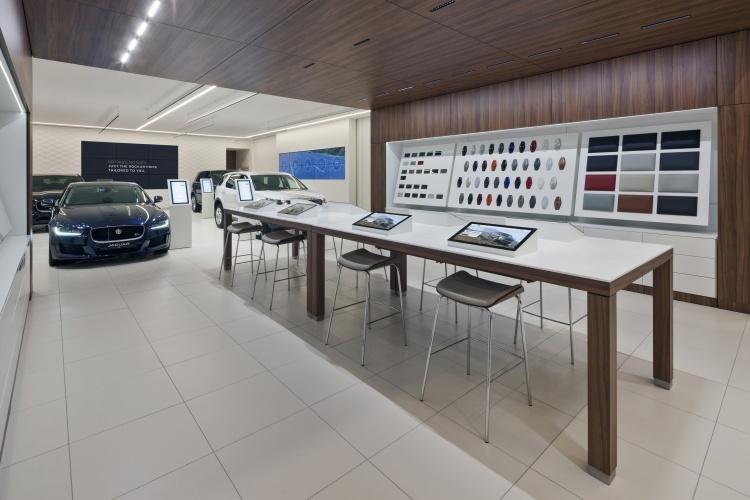 With their new retail space in Stratford, Jaguar Land Rover is looking to change that. Adopting a more ‘Apple Store’ approach, the shop is intended to inform consumers and bring them into the brand world, without laying on the hard sell at the end of it all. A gallery-style area of the store will display the various models of car available, and beyond this shoppers will be led into a ‘create’ section where they will be encouraged to experiment with different colour schemes and interiors to ‘build their own car’. Next, a more minimal space filled with screens will seek to educate and inform. Only then, if visitors are convinced of a purchase, will they have the opportunity to go into one of the discrete consultation lounges. The store will even be staffed by ‘Angels’, echoing Apple’s ‘Geeks’, who are explicitly described as “non-selling experts”. This move from Jaguar Land Rover is indicative of a wider trend within retail, with brands moving away from explicitly trying to ram products down people’s thoats and instead encouraging them to step into an experience. By allowing potential customers to explore a retail space free from the pressure of purchase, Jaguar Land Rover is breaking down the barrier between ‘buyer’ and ‘seller’. This barrier puts people on the defensive, feeling as if they need to be wary that the retailer is somehow pulling a fast one on them. Allowing the consumer to experience a brand on their own terms lets them make a purchase at their own pace, removing any ‘us versus them’ mentality and ultimately creating more loyal customers.